These colors are in stock now and ready to ship... As stock fluctuates daily, this is subject to change without notice. 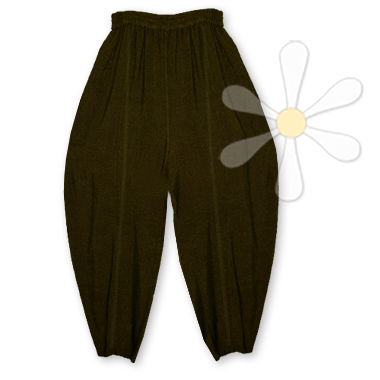 The original Moroccan harem pants straight from the portfolio of the famed Laise Adzer! These indescribably soft pants need to be experienced to understand why we love susti, and this style will make you feel like you've just stepped out of a souk in Casablanca, an Alexandrian bazaar... or even your own bed, because they're as yummy and comfy as your favorite jammies! They're a softly curved shape that's terrifically flattering, cut wide and slightly tapering towards the ankle. A lengthwise French seam divides each leg visually enhancing the vertical. Moroccan garments are all about layering color, weights, and textures -- create an outfit with a myriad of style choices from our collection to create your own expression. You're a goddess, you're extraordinary... express it every day!